Okay here's a few that I have no interset in playing but has bothered me for a long time. had an intro set in a cgi kitchen? segued off into a breakout clone featuring zany cartoon bugs? may or may not have referenced Shel Silversteins Peanut Butter Sandwitch poem. Looking it up online brought up the game Pantsylvania, could this be it? I think I remember that too but the title escapes me, a t first I thought UZ but I'm sure that's wrong. Ok, I remember this PC game, in the same style of the 90's Sierra point/click RPGs or the Quest for Glory series. Definitely a game of the 90's. You start as a man in a psychiatric ward (or maybe an hospital) and you have to get out. I remember you could use the fork used for your dinners to either untie yourself or open the window. You escape by the window and then make to a wine cave (or just a cave with barrels). Sound a bit wack like this but it's all I remember as I've seen 10 min of the game at a far away house where family relative were staying. I always wanted to play the game but never remembered the name or seen clips of it on Youtube. I remember a pc game I played that was a side scroller, maybe taking place in medieval times. You walked through villages and other areas as, a knight I think, smashing stuff (pots, etc.) but also enemies to slowly get stronger. God it was in the early 2000s I want to say. wish I could remember what it was. Recent game, may or may not even be released yet, all I've got to go on is that the main character might be wearing a white glove with a kind of portal/rift in the back of their hand that you can look through to solve puzzles? Is it not eye of the beholder? 7th Saga? I have recently seen that someone posted about lost games so I felt kind of encouraged for seek help for this. There are 3 games that I played about 10 years ago that I can't remember well - they were 4 but fortunately I found one in an Action 52 Genesis cart, "Go Bonkers" (big deal for a puzzle). The first was a NES game (for the graphics I'm almost -not entirely- sure that wasn't Genesis) that started with a white ninja in a snow field, just about to jump almost fullscreen, just after a black screen that said "AREA/STAGE 01", in classic white NES font. It was a side scroll game. In gameplay ninja moved around between ice platforms and there was one that had a gray rack for climb. All of that was just at the beggining, which is the only stage I remember. And the last was a medieval-greek hero killing dragons, riding dragons with an extremely large HUD and it was really, really hard to beat. Graphics where pretty detailed and I remember it as a Castlevania with dragons, but a lot less colorful (general palette for the first stage was similar to Golden Axe's). Aaaand there's a fourth one but not as important as the listed above. It was a puzzle EA game (IIRC blue EA logo belongs to old EA) in which you had to set green pieces in a [Longcat.jpg], very long blue board, with others dark blue blocks interfering. The final level was absolutely crazy to beat (blocks were reduced to the minimum size possible and filled all the board!) and it definitively belongs to Genesis. "Ask me about ROMs and your suffering will be legendary"
Are you sure the Cool Spot-like game was an RPG? I think the sequel (Spot Goes to Hollywood?) was an isometric game with a pirate ship. Or at least the screenshots I remember of it were, I never actually played the game myself. 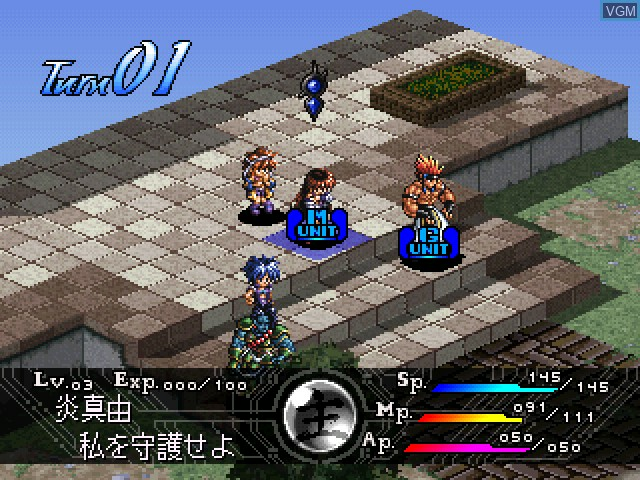 It's been awhile since I played it but maybe Dahna: Megami Tanjou? The puzzle game... is it Blockout? EA didn't originally make the game but I think they made or at least published the Genesis port. But this post sounds more like it should be in the "forgotten games thread". ..... so it WAS Cool Spot after all... shocked. I didn't thought it had sequels. 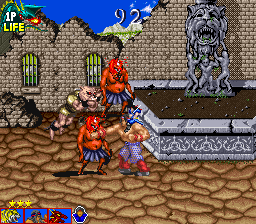 About killing dragons' game, nop, not so similar to Golden Axe. The main character was a strong dude with a sword, and the graphics weren't so simple. I could add that the first stage is in a open space made of stone, as a valley. The puzzle game was 2D and graphics were quite simple. Just the blue board, blue and green blocks, maybe some counter for the level. Anyways many, many thanks for hit with Cool Spof; if that was found anything can be found, I hope. The grey rack part makes me think of a Ninja Gaiden game, but the white ninja part doesn't... Shadow Dancer on Genesis has a white ninja. I can't think of any other NES games that fit that profile. You sure it's a ninja game? It could by Dragon Fighter by Natsume (starts in a snowy valley, and you are a dude with a sword there). I can't recall any other game like that at the moment, apart from Ninja Crusaders (though that one starts in a ruined city instead). If it's a Genesis game, it could be one of the Shinobi games. I hope someone can recognize this game. I recall a Super Famicom (or was it a PSX) game, its some sort of a strategy ala Ogre/FF Tactics where there's a Chun-Li look-a-like character and other female cast, and they have some sort of Jojo Stands with each of them. FINALLY after several years! Just found the game I was looking for! Its called GUARDIAN RECALL! I think I identified one of the ones I was looking for, it was Stay Tooned! it probably came to me via a shareware demo or something since we had some Sierra games we played back then. I had been searching forever for this one game, Black Knight, which can be found on sites like newgrounds and miniclip and even downloaded. It was a lot more simple now, in 2018, than I remember it being as an often drunk UNI student working night shifts in the summer when I first discovered it back in, had to be around 2004. Did anyone figure out what that first game was I remember a game where you went around in a dungeon like a First Person Shooter prospective but it wasn't and you would get attacked by rats, spiders, and I think you had a sword. I didn't play it much but I think it was like an early Tomb Raider maybe. I don't remember much of it but you would get killed very fast and you couldn't really read or tell what happened to you in the game. I think I played it on a MAC though and well the Mac Version of WolfenStein is what was converted to make the SNES version and is different from the PC Version it came from a different code base. One game I can't find is for the NES or at least I think so, I've searched for it for years as I've played every NES and possibly Famicom game there is or at least I have tried to play it.